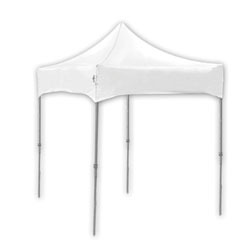 Enhance your business venture with this durable, easy to use canopy tent. This tent gives you 5"x 5" of enclosure and offers protection for your merchandise. The powder-coated steel frame is tough and reliable, yet surprisingly lightweight. The canopy top is available in 10 bold colors and is water resistant, fire retardant and UV protected. This one piece frame requires no assembly or extra parts and the entire tent can be set up by two people in less than 30 seconds. The tent can also be set up to 5 different heights, accommodating uneven ground. This product, including frame, canopy top, field spikes and a carrying bag also comes with a 1 year manufacturer's warranty.